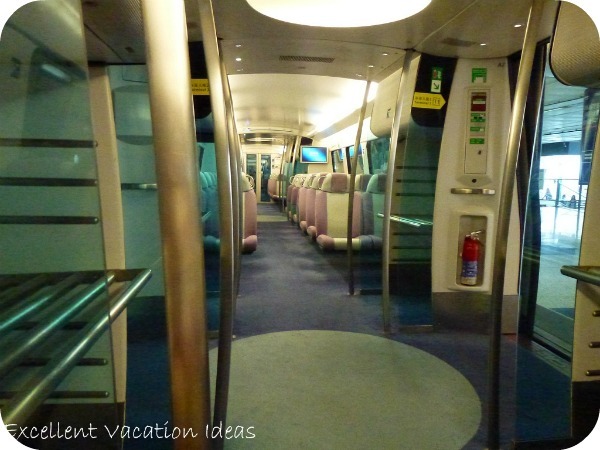 The Hong Kong Airport Express is the easiest and fastest way into Kowloon or Hong Kong from the Hong Kong airport. 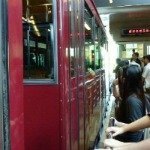 The Airport Express is the easiest and fastest way into Kowloon or Hong Kong. On a recent overnight stopover we realized just how easy it is! We had an overnight stopover on our way home from Bali in July 2011. We didn't arrive until 11 pm and were flying back to Toronto at 3 pm the next day. We wanted to make the most of the little time we had here (one of our favorite cities). We stayed at the Regal Airport Hotel right at the airport. The next morning we got up early, had some breakfast and went into Central station by the Hong Kong Airport Express train. We were impressed at how inexpensive and easy it was to use! We take the 4 minute walk from our hotel to the trains. We look to buy our tickets, again straight forward. You can purchase them from the Customer Service desk on the Arrivals Level or from a machine like the MTR machines. A Single Journey same day return for us was $100 HKD each (about $12.50 USD). 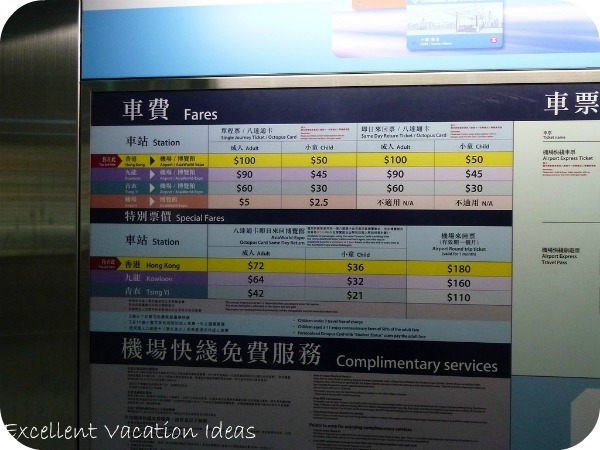 A round trip ticket costs $180 HKD for an adult. 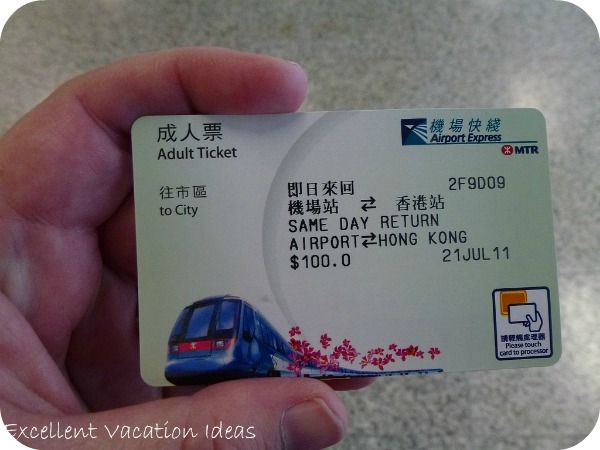 You can also purchase a tourist pass for $220 HKD that includes a one way ticket to the Airport and 3 days of unlimited travel on the MTR, Light rail and MTR buses. Or $300 HKD for a return ticket and 3 days on the MTR. It includes a $50 HKD refundable deposit for the Octopus Card. You can only stay in the area for a maximum of 14 days for these passes. We then got on the waited a few minutes for the next train. Once we were on the train we realized that we hadn't validated our ticket. We soon found out that you only validated it once you get to Central. The ride was smooth and pleasant. I kept wishing they would do something like this in Toronto! The trains were clean and you could choose a quiet car or regular car. There is plenty of room for luggage. We arrived right at Central and then walked to where we wanted to go (shopping at Marks and Spencer!). 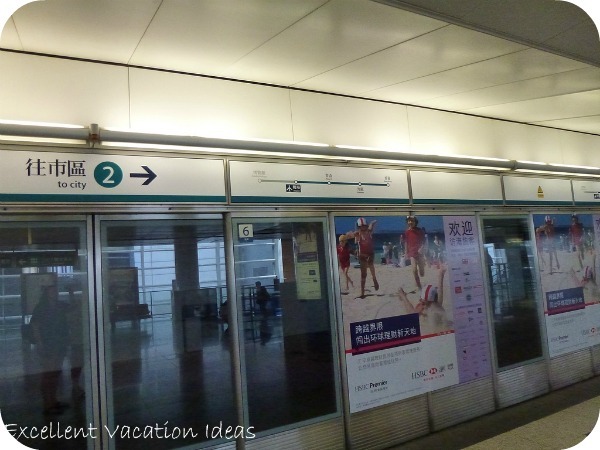 We spent a couple of hours shopping and then hopped back onto the Hong Kong Airport Express to the Airport to gather our bags and check in for our flight. 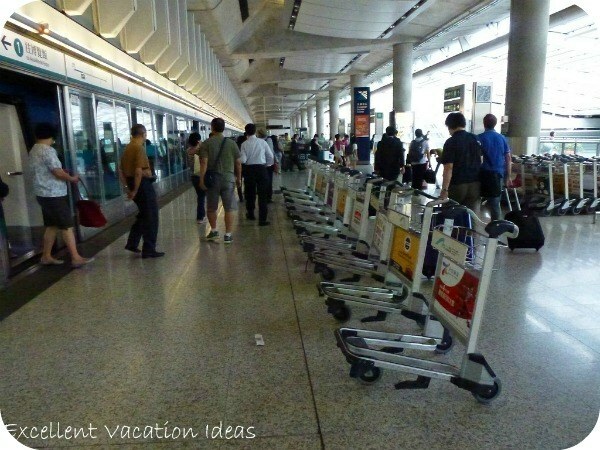 We were really impressed with the organization as when we arrived back at the Airport, the staff had arranged the carts so it was easy to put your luggage on it right away. 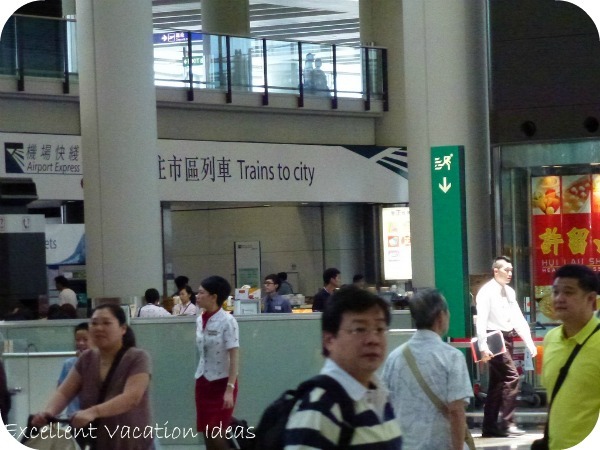 Once you arrive at Central or Kowloon you have to make your way to your hotel etc. with a lot of luggage that could be quite difficult. There are hundreds of taxi's to take you anywhere in Hong Kong, Kowloon, Lantau Island or the New Territories. 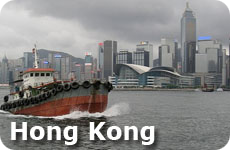 Taxi's to Hong Kong Island are approximately $300 HKD depending on where in you would like to go. To Kowloon, from $225 to $250 HKD. For larger parties with lots of luggage this may be the way to get into town and the taxi will take you right to your hotel door. 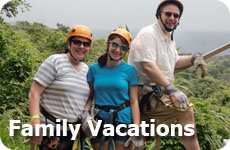 You can also take a Hotel coach or private limousine. Just check in the Arrivals hall for "Ground Transportation". You can also find public buses to take you to various parts of Hong Kong. More information on the Airport or arriving or departing at the Hong Kong International Airport.